This nine-week whole-church curriculum will help members see both the priority of evangelism for our churches, and to see the role that everyone can play in reaching out to those who are lost without Christ. Inside the Leader Kit box you will find a copy of the Leader's Guide, a copy of the Member's Handbook and a copy of the DVD containing nine teaching sessions presented by Erik Raymond (running time: 140 minutes). There is also a Quickstart Guide which lays out a variety of ways in which the material could be used within your own church context, some ideas for creating a church bulletin to promote the course in your church, and a code that will allow you to download a digital copy of the DVD for free. Many Christians are nervous about telling someone else about Jesus. We prefer to leave it up to the preacher, or to those we see as particularly gifted for evangelism in our congregations. But all believers are called to make disciples. The nine sessions in this curriculum don't offer quick fixes or evangelism gimmicks. But by continually pointing us back to the gospel, they will give us the proper motivation to work together as a church to share the gospel message with those who are lost without Christ. This flexible resource will train your whole church through teaching, preaching, daily reading and small-group Bible study and discussion or any combination of those elements. The overall aim is that your church will embark on a journey to discover the kind of people they should be as they are shaped by the gospel of Jesus Christ. 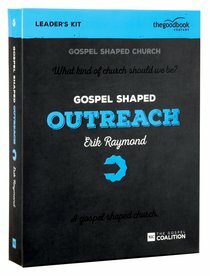 Additional copies of the Gospel Shaped Outreach Handbook and the Leader's Guide are available. About "Gospel Shaped Outreach (Dvd Leader Kit)"
This nine-week whole-church curriculum will help members see both the priority of evangelism for our churches, and to see the role that everyone can play in reaching out to those who are lost without Christ. Inside the Leader Kit box you will find a copy of the Leader's Guide, a copy of the Member's Handbook and a copy of the DVD containing nine teaching sessions presented by Erik Raymond (running time: 140 minutes). There is also a Quickstart Guide which lays out a variety of ways in which the material could be used within your own church context, some ideas for creating a church bulletin to promote the course in your church, and a code that will allow you to download a digital copy of the DVD for free. Erik Raymond is the Preaching Pastor at Emmaus Bible Church in Omaha, Nebraska, USA. He is married to Christie and has six children. Erik frequently writes for many publications including The Gospel Coalition, Ligonier and Tabletalk. He blogs at The Ordinary Pastor.